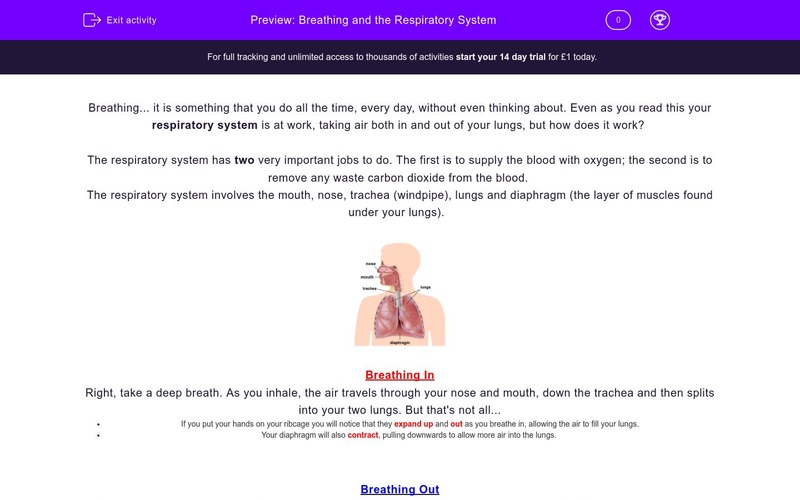 The worksheets describes the organs involved in the respiratory system and will test a students knowledge of the respiratory processes. Breathing... it is something that you do all the time, every day, without even thinking about. Even as you read this your respiratory system is at work, taking air both in and out of your lungs, but how does it work? The respiratory system has two very important jobs to do. The first is to supply the blood with oxygen; the second is to remove any waste carbon dioxide from the blood. The respiratory system involves the mouth, nose, trachea (windpipe), lungs and diaphragm (the layer of muscles found under your lungs). If you put your hands on your ribcage you will notice that they expand up and out as you breathe in, allowing the air to fill your lungs. Your diaphragm will also contract, pulling downwards to allow more air into the lungs. As you breathe out, the opposite occurs. The exhaled air leaves your lungs, travels up the trachea and then leaves your body through your nose and mouth. If you put your hands on your ribcage you will notice that it drops in and down as you breathe out, allowing the air to be pushed out of the lungs. Your diaphragm will also relax, pulling upwards allowing more air to be pushed out of the lungs. What is the role of the respiratory system? To break down food into small soluble molecules. To carry blood around the body. To supply the blood with oxygen and remove waste carbon dioxide. To supply the blood with water. 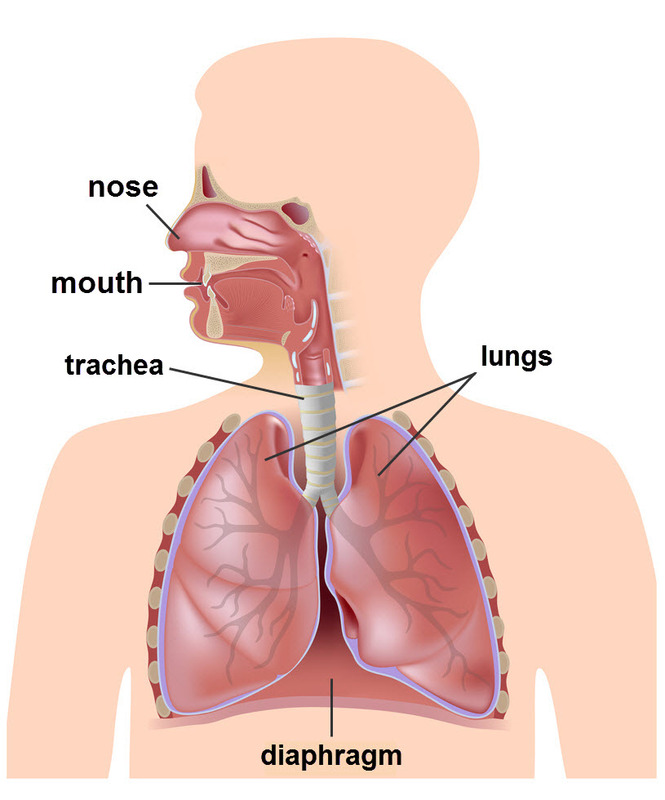 Which of the following are involved in the respiratory system? What is the name given to the layer of muscles found under the lungs that helps to to move air into and out of the lungs? What happens to the ribcage as you breathe in? What happens to the diaphragm as you breathe out? Match the correct part of the respiratory system with what it does during inhalation. If you can't read all of the words in the boxes, hover your mouse over them. From the diagram below, what is picture A representing? 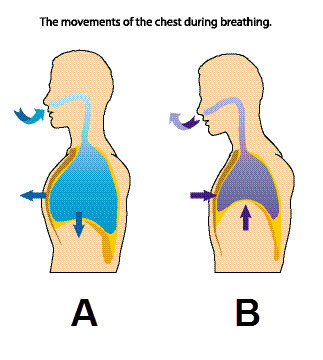 Which of the following occur when you breathe in and out? The role of the respiratory system is to supply the blood with oxygen and to remove waste carbon dioxide from the body. The diaphragm is the layer of muscle found under the lungs, which contracts to assist breathing. When we breathe in, our ribcages move up and out. This increases the volume inside the ribcage which results in air rushing into the lungs. As we breathe out, our diaphragms relax, becoming dome shaped. This decreases the volume inside the ribcage, forcing air out of our lungs. The trachea is the windpipe that the air travels down to get to the lungs. The ribcage moves up and out and the diaphragm contracts, becoming flattened, increasing the volume inside the ribcage and causing air to fill the lungs. 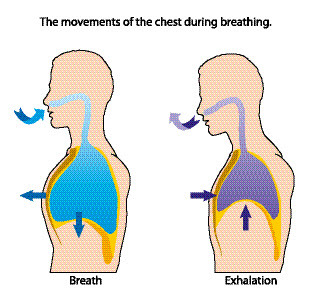 Picture A shows the body inhaling (breathing in). The ribcage moves up and out, the diaphragm contracts and air rushes into the lungs.